Depends on the season. "Normal," would be 100% of average snow pack, and at certain elevations, maybe 7,000 to 12,000 feet. In years like that, snow would melt gradually through the spring and summer. Some of the snow above 9,000, 10,000 feet could remain. But in some years with cold storms it snows down to 3,000 feet, and that can be problematic if an upcoming storm would be much warmer, melting that snow. Levees can fail for a variety of reasons, but usually in California they get perforated by ground squirrels and sometimes cracked from plate movements (once, about 30 years ago, the vibrations from freight trains defeated a levee!) When I worked along side the State OES in the 90's there was a lot of concern over the levees surrounding Sacramento giving up. Those at Costco aren't black walnuts but most likely Chandler or Hartley grown on black walnut rootstock. Black Walnuts grow like weeds around here if left unchecked, and are boogers to abate. Very tasty little nuts in rock hard shells ,so commercially they're not very feasible. The wood is delightful to work with though. Try a scoop of Black Walnut ice cream if you want to know what they taste like---it'll be easier on your chops! I've always been called Paulie. When that stupid show came out, everybody started calling me Paulie Walnuts. I objected. Now my longterm friends call me Walnuts. You can't call me Walnuts, Goose. 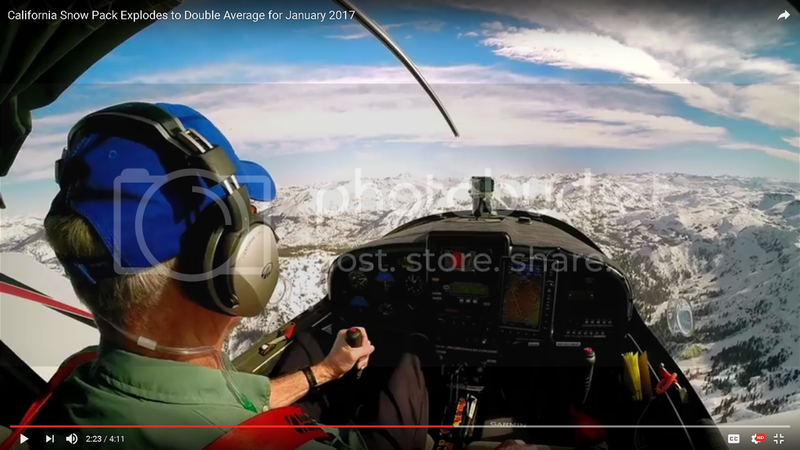 I am pleased that my Sierra Nevada snow pack low level fly over is getting so much air time. I love the accompanying music on the vid. Fou. Vous êtes completement fou. French women are charming, but the hairy legs and armpits are an aversion to me. Is she preparing to do a low level fly over of the Sierra Nevada snow pack on that giant corn on the cob? Wow. I was really expecting you to be able to tell me what that was all about. "completement fou" is French for completely crazy. What the hell makes you think anyone's looking at your original post? Yes. I know that. Now, shall we follow this to its logical conclusion? Parce qu'il est completement fou? C'est vrai, n'est pas? Interesting presentation on the CA Sierra Nevada snow pack as of March 3rd. Before another 5 feet fell above 5000 feet. At one point in the presentation he mentions scientists don' even have instruments to measure the snow depth now, it is so enormous. 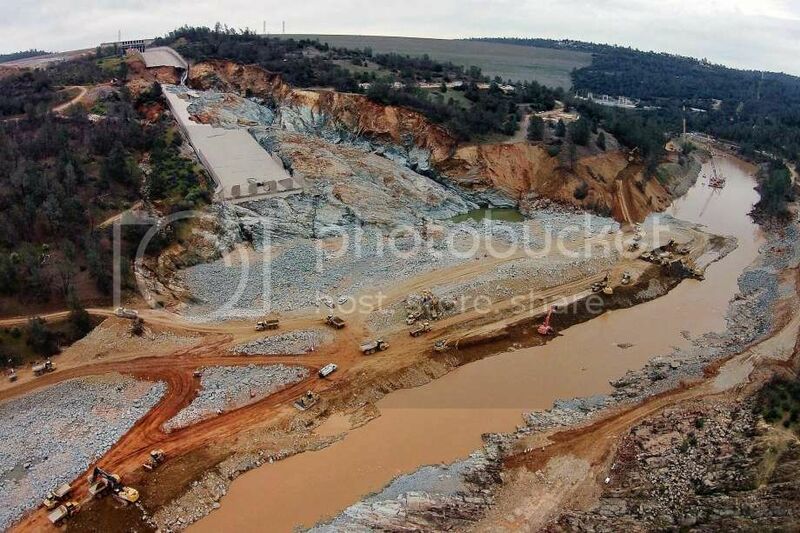 Here in the pic we can see that CA's Lake Oroville Dam's spillway has been absolutely destroyed. Engineers must be scratching their heads wondering how/ where a new spillway can be built, and how long that would take. But the worried folk up there aren't out of the woods yet. Whats left of this spillway still needs to handle a whole bunch of snow melt. I used to live on a knoll above the spillway, and still have friends living around that area. At times we would have a free vibrating bed because of the force of 100,000 cubic feet per second thundering down. I thought I'd bump it. The same phenomena that happened during the winter of 2016/17 is happening again. California is getting slammed by storm after storm. Next spring and summer ground cover plants will grow, and then dry up and die after another winter or two of low to no rain. Setting the stage for more crazy wildfires. 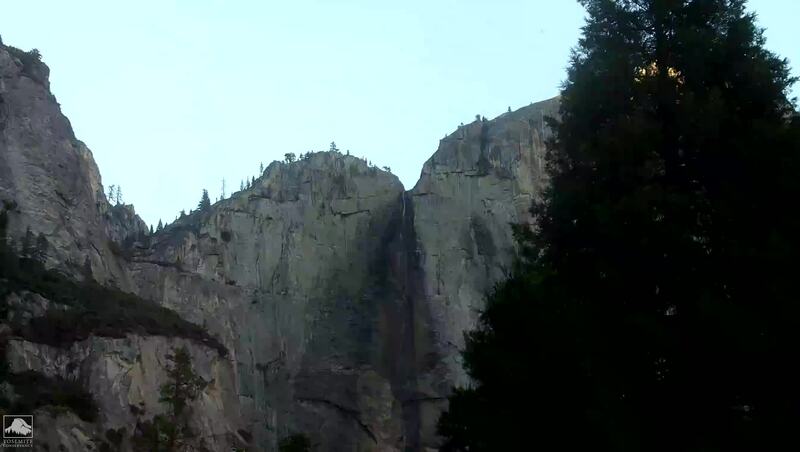 The roads are closed in Yosemite. All those dead standing trees from the drought/beetle infestation couldn't handle the snow and are falling all over the place. The rangers asked everyone in Yosemite Valley to stay indoors to avoid the "widow makers." Yosemite has received heavy snow, which has caused numerous trees to fall. As a result all roads are currently closed. Call 209/372-0200 (then 1, 1) to check current road status. People in Yosemite should stay indoors if possible to avoid falling trees.